DIE Veneris, videlicet, 26 die Januarii. Report of the Conference, about rectifying the Disorders in St. James s House. Committee to visit the King's Children, and enquire about some of their Servants being dismissed without the Knowledge of this House. French Ambassador's Servant, a Pass. Discovery of a Plot, for dividing England and Scotland, and betraying Aylsbury. Colonel Mosely thanked for his Service at Aylsbury. Message to the H. C. for a Conference concerning this Plot. Parties to be rewarded who made the Discovery. Assembly to be acquainted with these Matters. Upon reading the Petition of Tho. Jenyns Esquire, desiring, "That the Bonds in the Hands of the Clerk of the Parliament [ (fn. 1) may remain] in his Hands until the Pleasure of this House be known: Secondly, To appoint some Time for the Petitioner to make good his Allegations before this House; and Sir Thomas Dawes to attend upon this Issue, whether the said Bonds are in Trust or not." Hereupon this House Ordered, That the said Sir Thomas Dawes shall have a Copy of this Petition, and return his Answer; and the said Bonds to remain in the Hands of the Clerk of the Parliament, until the Pleasure of this House be further known. 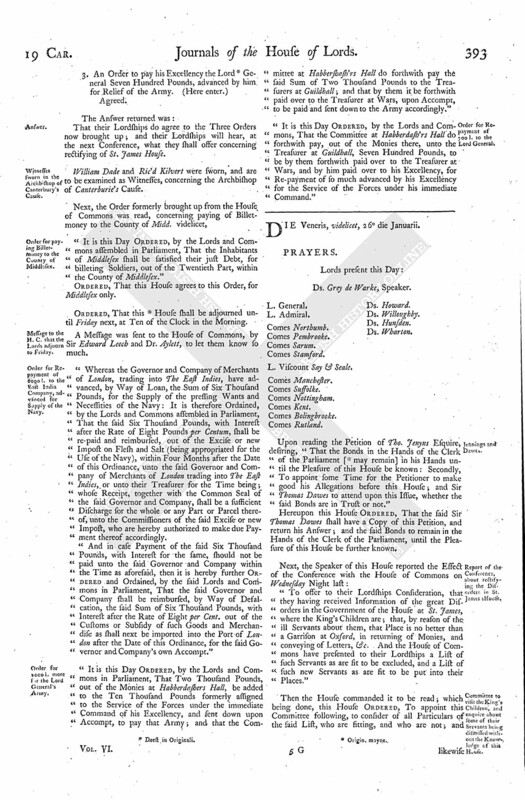 "To offer to their Lordships Consideration, that they having received Information of the great Disorders in the Government of the House at St. James, where the King's Children are; that, by reason of the ill Servants about them, that Place is no better than a Garrison at Oxford, in returning of Monies, and conveying of Letters, &c. And the House of Commons have presented to their Lordships a List of such Servants as are fit to be excluded, and a List of such new Servants as are fit to be put into their Places." 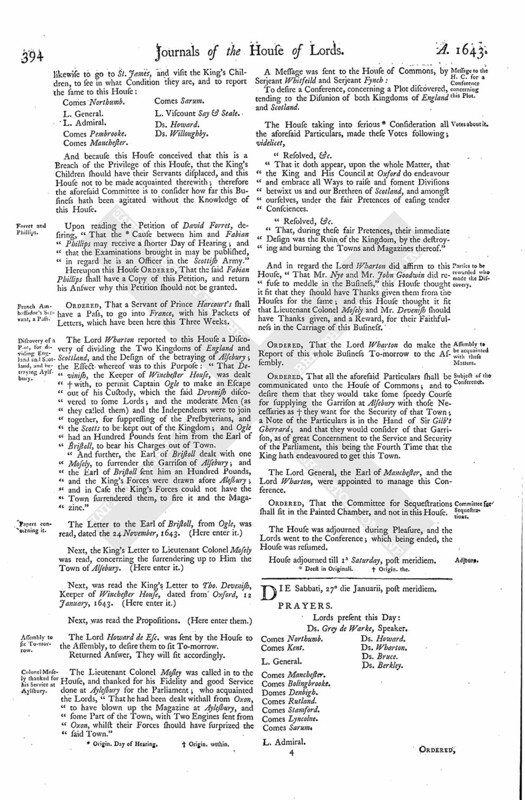 And because this House conceived that this is a Breach of the Privilege of this House, that the King's Children should have their Servants displaced, and this House not to be made acquainted therewith; therefore the aforesaid Committee is to consider how far this Business hath been agitated without the Knowledge of this House. Upon reading the Petition of David Forret, desiring, "That the (fn. 2) Cause between him and Fabian Phillips may receive a shorter Day of Hearing; and that the Examinations brought in may be published, in regard he is an Officer in the Scottish Army." Hereupon this House Ordered, That the said Fabian Phillips shall have a Copy of this Petition, and return his Answer why this Petition should not be granted. Ordered, That a Servant of Prince Harcourt's shall have a Pass, to go into France, with his Packets of Letters, which have been here this Three Weeks. The Lord Wharton reported to this House a Discovery of dividing the Two Kingdoms of England and Scottland, and the Design of the betraying of Alsebury; the Effect whereof was to this Purpose: "That Devinish, the Keeper of Winchester House, was dealt (fn. 3) with, to permit Captain Ogle to make an Escape out of his Custody, which the said Devenish discovered to some Lords; and the moderate Men (as they called them) and the Independents were to join together, for suppressing of the Presbyterians, and the Scotts to be kept out of the Kingdom; and Ogle had an Hundred Pounds sent him from the Earl of Bristoll, to bear his Charges out of Town. "And further, the Earl of Bristoll dealt with one Mosely, to surrender the Garrison of Alsebury; and the Earl of Bristoll sent him an Hundred Pounds, and the King's Forces were drawn afore Alesbury; and in Case the King's Forces could not have the Town surrendered them, to fire it and the Magazine." The Lord Howard de Esc. was sent by the House to the Assembly, to desire them to sit To-morrow. Returned Answer, They will sit accordingly. The Lieutenant Colonel Mosley was called in to the House, and thanked for his Fidelity and good Service done at Aylesbury for the Parliament; who acquainted the Lords, "That he had been dealt withall from Oxon, to have blown up the Magazine at Aylesbury, and some Part of the Town, with Two Engines sent from Oxon, whilst their Forces should have surprized the said Town." To desire a Conference, concerning a Plot discovered, tending to the Disunion of both Kingdoms of England and Scotland. "That it doth appear, upon the whole Matter, that the King and His Council at Oxford do endeavour and embrace all Ways to raise and foment Divisions betwixt us and our Brethren of Scotland, and amongst ourselves, under the fair Pretences of easing tender Consciences. "That, during these fair Pretences, their immediate Design was the Ruin of the Kingdom, by the destroying and burning the Towns and Magazines thereof." And in regard the Lord Wharton did affirm to this House, "That Mr. Nye and Mr. John Goodwin did refuse to meddle in the Business," this House thought it fit that they should have Thanks given them from the Houses for the same; and this House thought it fit that Lieutenant Colonel Mosely and Mr. Devenish should have Thanks given, and a Reward, for their Faithfulness in the Carriage of this Business. Ordered, That the Lord Wharton do make the Report of this whole Business To-morrow to the Assembly. Ordered, That all the aforesaid Particulars shall be communicated unto the House of Commons; and to desire them that they would take some speedy Course for supplying the Garrison at Alsebury with those Necessaries as (fn. 5) they want for the Security of that Town; a Note of the Particulars is in the Hand of Sir Gilb't Gherrard; and that they would consider of that Garrison, as of great Concernment to the Service and Security of the Parliament, this being the Fourth Time that the King hath endeavoured to get this Town. The Lord General, the Earl of Manchester, and the Lord Wharton, were appointed to manage this Conference. Ordered, That the Committee for Sequestrations shall sit in the Painted Chamber, and not in this House. House adjourned till 1a Saturday , post meridiem. 2. Origin. Day of Hearing.